Our upcoming White House resident, Il Douche-y, is giving us a preview of what is to come in his new cabinet. Ben Carson for Secretary of Education? 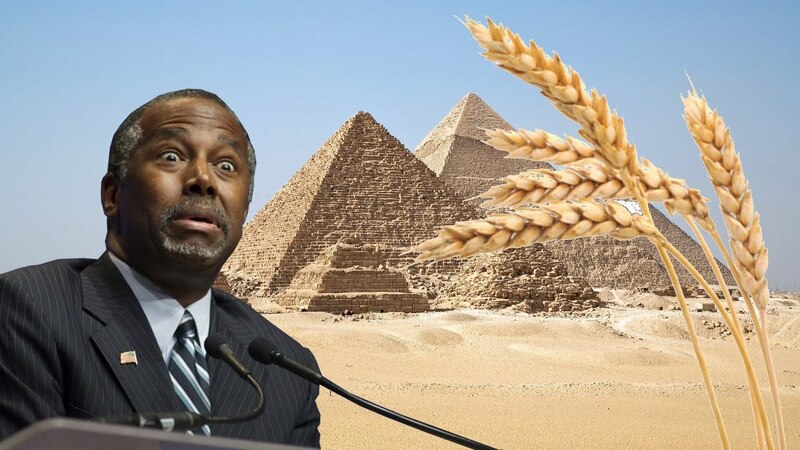 What is in store for the kids…field trips to search for Joseph’s grain in the pyramids? We’re not talking respect for religion here, we are talking batshit crazy. As far as the other picks go, we have the usual suspects of reactionary retreads (Gingrich, Giuliani, Palin, Bolton) rewarded for loyalty and adherence to wingnuttery, industry hacks (Hamm, Lucas, Mnuchin) to perpetuate ‘pay to play,’ subsidies to Big Ag, Big Oil and further weakening of financial regulations, and cold warrior Sessions on Defense. The polls show that the residents of Dumbfuckistan overwhelmingly voted for Trump to ‘change,’ but if this proposed lineup is any indication…they are in for a rude awakening.